Nothing beats a cold day like a hot bowl of homemade soup. 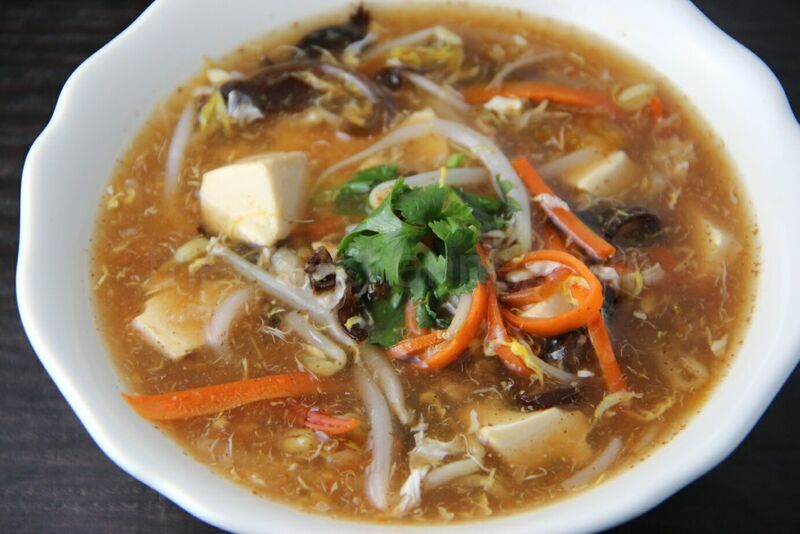 This hot and sour soup will awake your taste buds and warm up your stomach in the cold weather. I used a homemade chicken stock in the recipe below, but a box of chicken stock would also work in a pinch and save you 1.5 hours of cooking time. 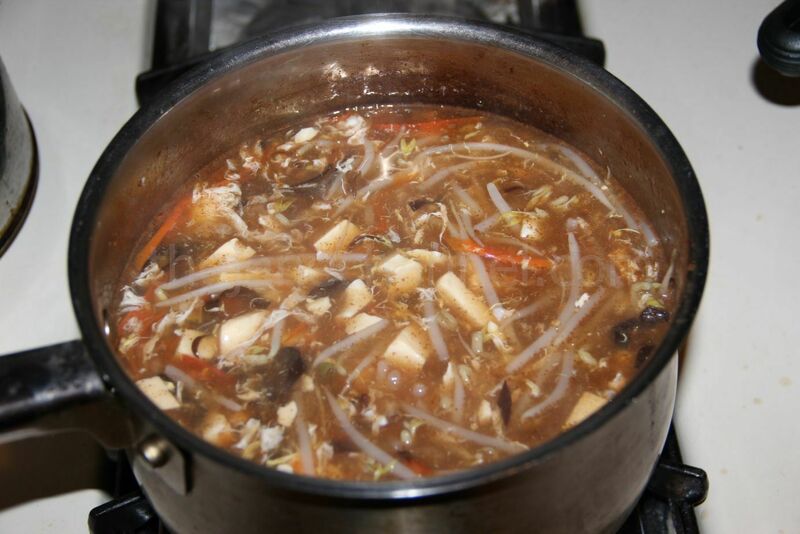 Shiitake mushrooms and bamboo shoots are often used for this soup which can be added here as well. On the other hand, bean sprouts is an unconventional ingredient for this recipe, but it is actually my favorite addition. As you can probably tell, it is a very versatile soup and you can adjust some of the ingredients to your liking. In a pot of hot boiling water, add 2 slices of ginger and fish maw. Let it cook over high heat for 20 minutes. Turn off the heat and cover for 30 minutes. Drain and cut into 2 inches a piece. Prepare chicken stock – bring a pot of water (5 cups) to boil. Add chicken, carrots chucks, and ginger to the pot. When it comes to boil again, lower the heat and simmer for 1.5 hours. 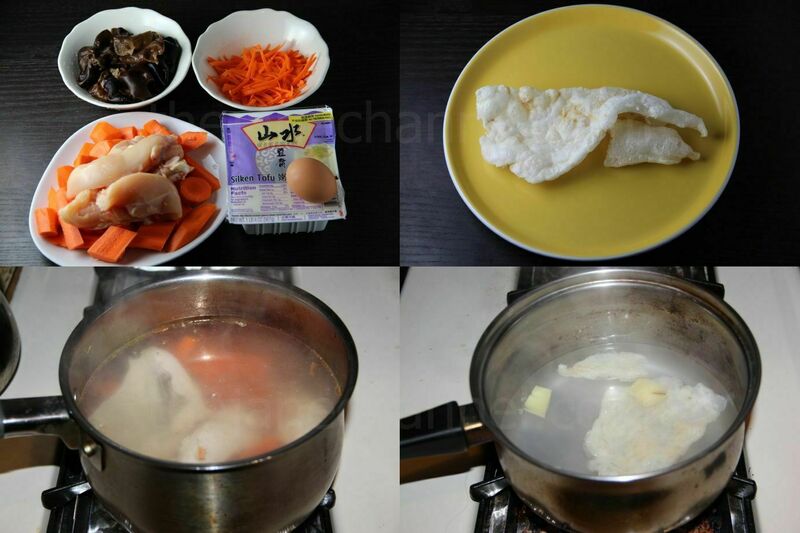 Remove chicken, carrots, and ginger from the pot. Bring the soup to boil over high heat. Add carrots, wood ear and fish maw. When it comes to boil again, lower the heat and simmer for 5 minutes. Cut the tofu into strips. When it boils again, stir in tofu. Add soy sauce, vinegar and pepper. When it boil again, add bean sprouts, cook for 30 seconds. Lastly, turn off the heat. Crack the egg and stir quickly. Add cilantro, sesame oil and chili oil for your taste. Serve while it is still very hot.